The health benefits of legumes include blood pressure lowering effects, and cholesterol lowering effects as well as antidiabetic effects. 1-3 For example, kidney beans and groundnuts reduces total cholesterol by 6-7%.1 Many of the benefits are mediated through their high fiber content although other mechanisms may also be involved. Large differences exist in the degree to which different starch containing foods affect the blood glucose levels of both normal volunteers and diabetics. These differences appear to relate to the digestibility of the starch which in turn is determined by the interaction of starch with fiber and protein in the food. The nature of the starch itself and its physical form (e.g., raw or cooked, ground or whole) are also important. For both grains and legumes, fine grinding disrupts cell structures and renders starch more readily accessible for digestion. 1. Trinidad TP, Mallillin AC, Loyola AS, Sagum RS, Encabo RR. 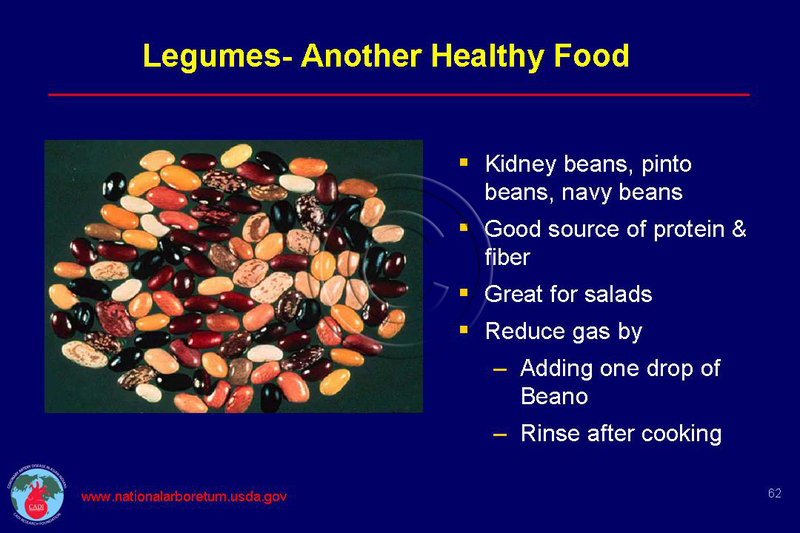 The potential health benefits of legumes as a good source of dietary fibre. Br J Nutr. Feb 2010;103(4):569-574. 2. Lee YP, Puddey IB, Hodgson JM. Protein, fibre and blood pressure: potential benefit of legumes. Clin Exp Pharmacol Physiol. Apr 2008;35(4):473-476. 3. Tang GY, Li XJ, Zhang HY. Antidiabetic components contained in vegetables and legumes. Molecules. 2008;13(5):1189-1194. 4. Venn BJ, Mann JI. Cereal grains, legumes and diabetes. Eur J Clin Nutr. Nov 2004;58(11):1443-1461. 5. Thorne MJ, Thompson LU, Jenkins DJ. Factors affecting starch digestibility and the glycemic response with special reference to legumes. Am J Clin Nutr. Sep 1983;38(3):481-488.